Paul Townend enjoyed his first winner at the Cheltenham Festival as What A Charm landed the Fred Winter Handicap Hurdle in a thrilling finish to give Irish-trained horses a sixth straight success on the day at cumulative odds of 1,525,919/1. The 20-year-old has enjoyed a stellar campaign as second jockey to Willie Mullins having ridden plenty of Grade One winners in Ireland, including aboard Hurricane Fly who took yesterday’s Champion Hurdle under Ruby Walsh. What A Charm is trained by Arthur Moore and the 9/1 chance just got the better of the front-running Kumbeshwar after a tremendous battle to score by a neck. Townend said: “It is unbelievable to ride a winner here and I am grateful to Arthur Moore and the owners for giving me the opportunity. “I have been very lucky to ride Hurricane Fly this season and that will do me and I had a great spin off my horse to finish fourth behind him in the Champion Hurdle yesterday. Moore added: “She had to run as she was well handicapped and has really turned in her coat the last two weeks. “I thought this may be a bit sharp for her but she has done it well and it is a great thrill to be here. “This winner’s enclosure is a very hard place to get to. 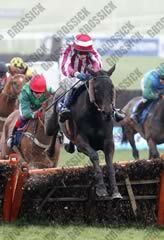 We have been lucky here in the past but were due another auccess and it is our first hurdle winner here. “I was a great admirer of Fred Winter and once did evening stables with him. We came around to a hairy-looking horse and he said what do you think of him - he’s a store horse who we have just brought over from Ireland. I replied he might be all right with a bit of time and he said - that’s Sonny Somers and he’s 15 years old! Despite carrying top weight of 11st 10lb the Alan King-trained Kumbeshwar ran a blinder to finish second in the Fred Winter Juvenile Handicap Hurdle. What A Charm, receiving 18lb, proved just too quick from the final flight, but King was thrilled with Kumbeshwar - and also with third-placed Dhaafer and fifth Jubail, who are also trained at his Barbury Castle Stables. King said: “All three have run well and I’m very proud of them. Kumbeshwar has run a hell of a race at the weights. He’s getting better all the time and is a grand horse. I see no reason why all three won’t be out again this season - Dhaafer is crying out for two and a half miles, but that might not be until next season.